On this beautiful Spring day it had been raining all morning on our way to Payson, Utah. As we reached the Payson temple we were blessed with immediate beautiful weather. The rain stopped, the clouds parted and the sun came out. I could not have asked for a better shot. I love the colors in the image, with the clouds in the background and the blue sky peeking through. I feel it has a wonderful contrast to the colors of the temple. 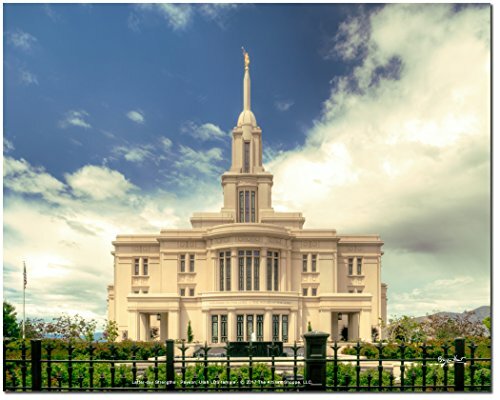 This beautiful photograph of the Payson, Utah LDS temple is designed to capture the spirit of the temple and brings beauty and the spirit into your home or office. The Payson, Utah temple was dedicated on June 7, 2015 as the 143rd currently operating temple of The Church of Jesus Christ of Latter-day Saints. This photograph was shot May 21, 2017 by LDS photographer Bryan Hunt - whose signature is included on this print. 10% of every sale is donated to the Church of Jesus Christ of Latter-day Saints missionary fund. Printed on High Quality Premium Archival paper, LDS art, Perfect to frame and hang in your home or office.